Your art and photography will look stunning with these high definition displays. Artwork arrives ready to hang, with black chamfered sides and pre-drilled mounting holes on the back. Actual thickness of the panels is 0.625”. At a little more than ½” thick these panels are an ideal choice for many applications and settings without the need to be framed. The chamfered black sides give it that finished look you require. Fade and scratch resistant. 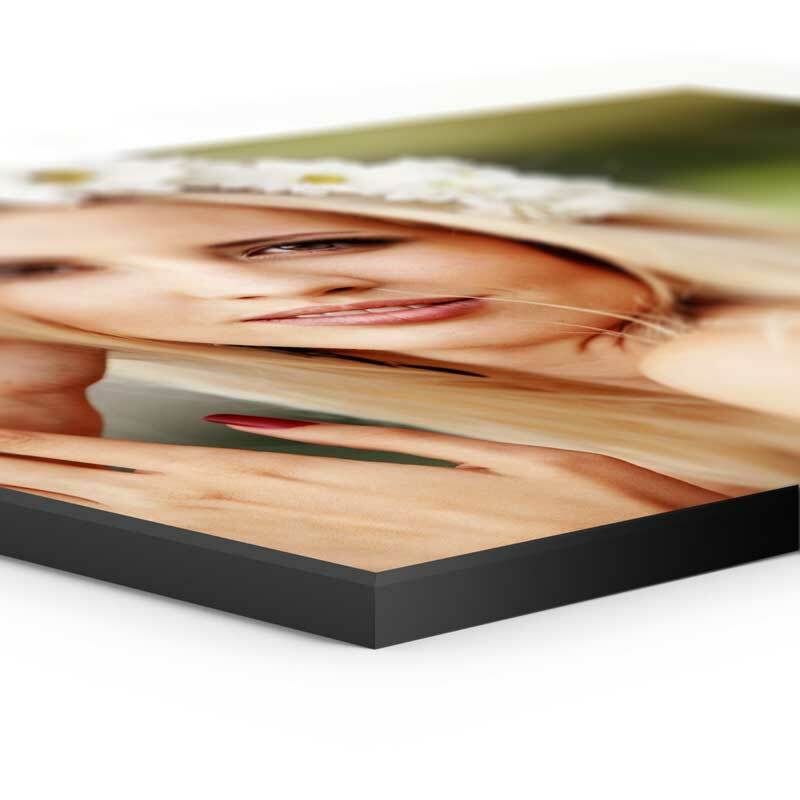 Instead of printing and image and then mounting it, the image is sublimated / fused directly onto the surface. It allows for incredible detail to show. The surface can be dusted or even cleaned with a soft damp rag without danger of scratching or harming the image. Recommended Image Dimensions: 5 x 7"
5" x 7" x 0.625" Wall Art Photo Panels provide a vibrancy and durability that make it the best art and photo panel on in the market. The panels are a favorite product among both artists and fine art photographers. The sides are black while the face has a low gloss white base. Pre-drilled keyholes on the back that make them ready to hang. 8x10 and smaller sizes include a kickstand easel option for tabletop display. Recommended Image Dimensions: 6 x 6"
6" x 6" x 0.625" Wall Art Photo Panels provide a vibrancy and durability that make it the best art and photo panel on in the market. The panels are a favorite product among both artists and fine art photographers. The sides are black while the face has a low gloss white base. Pre-drilled keyholes on the back that make them ready to hang. 8x10 and smaller sizes include a kickstand easel option for tabletop display. Recommended Image Dimensions: 8 x 8"
8" x 8" x 0.625" Wall Art Photo Panels provide a vibrancy and durability that make it the best art and photo panel on in the market. The panels are a favorite product among both artists and fine art photographers. The sides are black while the face has a low gloss white base. Pre-drilled keyholes on the back that make them ready to hang. 8x10 and smaller sizes include a kickstand easel option for tabletop display. Recommended Image Dimensions: 8 x 10"
8" x 10" x 0.625" Wall Art Photo Panels provide a vibrancy and durability that make it the best art and photo panel on in the market. The panels are a favorite product among both artists and fine art photographers. The sides are black while the face has a low gloss white base. Pre-drilled keyholes on the back that make them ready to hang. 8x10 and smaller sizes include a kickstand easel option for tabletop display. Recommended Image Dimensions: 11.6 x 11.6"
11.6" x 11.6" x 0.625" Wall Art Photo Panels provide a vibrancy and durability that make it the best art and photo panel on in the market. The panels are a favorite product among both artists and fine art photographers. The sides are black while the face has a low gloss white base. Pre-drilled keyholes on the back that make them ready to hang. 8x10 and smaller sizes include a kickstand easel option for tabletop display. Recommended Image Dimensions: 11 x 14"
11" x 14" x 0.625" Wall Art Photo Panels provide a vibrancy and durability that make it the best art and photo panel on in the market. The panels are a favorite product among both artists and fine art photographers. The sides are black while the face has a low gloss white base. Pre-drilled keyholes on the back that make them ready to hang. 8x10 and smaller sizes include a kickstand easel option for tabletop display. Recommended Image Dimensions: 9 x 18"
9" x 18" x 0.625" Wall Art Photo Panels provide a vibrancy and durability that make it the best art and photo panel on in the market. The panels are a favorite product among both artists and fine art photographers. The sides are black while the face has a low gloss white base. Pre-drilled keyholes on the back that make them ready to hang. 8x10 and smaller sizes include a kickstand easel option for tabletop display. Recommended Image Dimensions: 16 x 20"
16" x 20" x 0.625" Wall Art Photo Panels provide a vibrancy and durability that make it the best art and photo panel on in the market. The panels are a favorite product among both artists and fine art photographers. The sides are black while the face has a low gloss white base. Pre-drilled keyholes on the back that make them ready to hang. 8x10 and smaller sizes include a kickstand easel option for tabletop display. Recommended Image Dimensions: 20 x 30"
20" x 30" x 0.625" Wall Art Photo Panels provide a vibrancy and durability that make it the best art and photo panel on in the market. The panels are a favorite product among both artists and fine art photographers. The sides are black while the face has a low gloss white base. Pre-drilled keyholes on the back that make them ready to hang. 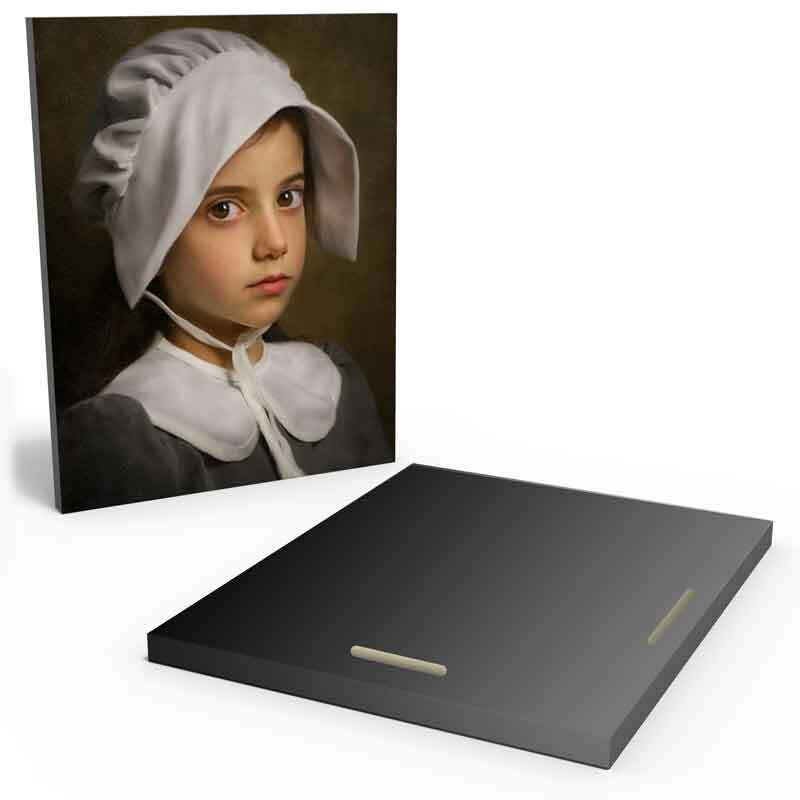 8x10 and smaller sizes include a kickstand easel option for tabletop display.